Limestone and travertine are used extensively in both interior and exterior building projects throughout the state of Florida. Their popularity as a flooring tile, patio covering, or bathroom wall finish is evident in the sheer number of homes and offices utilizing these natural stone materials. Especially favored are the cream and ivory tones, and these stone tiles are quite affordable when obtained from a direct importer and distributor. The Nalboor Tiles website showcases the natural stone tiles available from Stonexchange, a local Miami importer of superior quality limestone, travertine, and marble products. Specializing in bulk orders, we offer some of the lowest prices in the industry on tiles that are the perfect replacement for instructions specifying cream limestone. Limestone is a sort of sedimentary rock that is formed when water containing certain minerals and contaminants percolates through a layer of soil. Caves filled with stalactites and stalagmites are a perfect example of how this rock comes to exist. Travertine is a type of limestone that is formed when hot water laden with minerals seeps through a layer of packed soil. Generally found in areas that once contained hot springs, travertine is extracted using large cable saws or water jets. These natural stone materials are thinned into sheets and subsequently cut into tiles. The material is somewhat porous, but modern manufacturing techniques include the adding of a sealant to make the stone much more moisture-resistant. The end result is a beautifully polished or honed natural stone tile, one that looks perfect when set against complementing accent shades. The cream shades of limestone are those often designated in the tile industry as Ivory, Saturnia, or Vanilla. These limestone tiles are generally off-white, with a creamy glow that is not too intense. The rock is full of pale swirls that are the result of the contaminant action of the percolating water over a period of thousands of years. Cream limestone shades look their best when they are complemented by darker tones. Although the walls of the room may also be a light color shade, the furniture, draperies, and upholstery is often medium- to dark tone. Cream limestone has medium reflectivity, meaning that the room will look nicely brightened without the creation of an annoying glare. Cream limestone and ivory-shaded travertine are also popular for use in the bath area. Jewel tones that are dominated by greens and blues complement the light-shaded floor or wall tiles, and polished mirror frames help to create a secondary accent. Cream limestone is often used as patio coverings as well, with the resulting look being one that is both rustic and contemporary. Stonexchange is a Miami-based importer of natural stone materials for residential and commercial applications. Our company imports full container loads of limestone, marble, travertine, and other natural stone products from its overseas manufacturing center. For the most part, Stonexchange offers its products in bulk orders only, meaning that the majority of sales are to retail merchants and construction companies. However, the Nalboor Tiles website features natural stone tiles available to the general public as well as to commercial clients. The price per tile varies and depends on the number of tiles purchased. The larger the order, the more affordable the product. Bulk orders containing a full-pallet or full-crate of material are truly wholesale in nature, and the customer enjoys these low prices because he or she is purchasing directly from the manufacturer. Stonexchange maintains a large inventory of product at its Miami-based distribution center. This means that local merchants, resellers, installers, and construction contractors can order large amounts of material and have it delivered in just a few days. Again, the price quote given on the various styles of limestone and travertine tiles will depend on the size of the order. The Nalboor Tiles website features all of the natural limestone tile products offered by Stonexchange. As mentioned earlier, cream limestone is a term that refers to the lighter shades of this natural stone. The two popular tiles shades available from Stonexchange are Shell Reef limestone and Saturnia Ivory travertine. Shell Reef limestone is an off-white, creamy ivory tone that has a brushed surface finish. The color varies slightly from one tile to another, mainly because of the spotting patterns. This makes the stone very popular for use as a floor or wall tile because of the virtually endless number of placement patterns. A block of tiles will have the same overall color and appearance, but small sections of the wall or floor will contain a very specialized pattern of spotting or swirls. Shell Reef limestone tiles are manufactured in a 24-inch square size, but clients are more than welcome to ask about custom-size tiles for specialized installations. The thickness of the standard tiles is 5/8-inch, meaning that the tile is very sturdy and can withstand sharp impacts. The edges have been straightened using the most technologically advanced cutting equipment, the result being easy placement by the installer with no gaps to fill between tiles. Saturnia Ivory travertine is one of the lightest shades of this material currently available on the market. It is a medium tone, much lighter than noche or mocha, and is dominated by swirl patterns of mineral contaminants. This product is very popular for use as a shower stall wall covering, as a patio tile, or as the dominant tile on a kitchen backsplash. The Saturnia Ivory travertine tiles available from Stonexchange are cut to an industry standard 12-inch square size. The thickness is 5/8-inch, and the top surface has been given a honed finish. Unlike the rougher travertine tiles manufactured in large, 36-inch length boards, these specialty tiles contain no large holes and have no pockmarks around the edges. 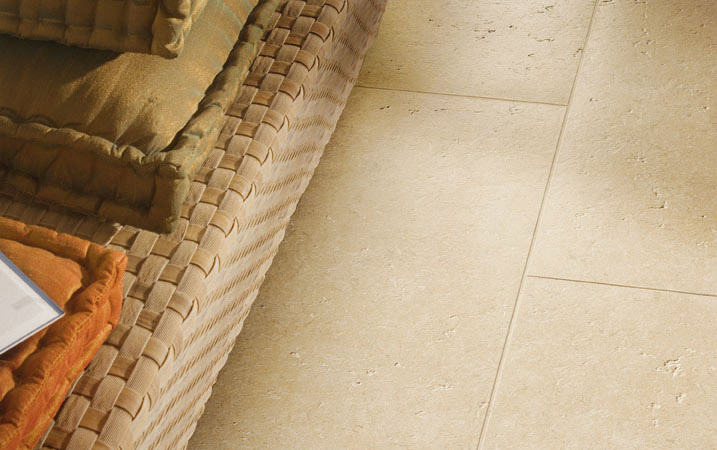 Retail prices on limestone and travertine tiles currently hover around $6.00 per square foot. Commercial clients looking for an exceptional deal on cream limestone tiles will find that the wholesale price on both of the fine products mentioned above begins well below this figure. Remember, the larger the order, the greater the savings. Stonexchange maintains a high level of quality control on all of its tile products. This procedure of quality assurance begins at the quarry and continues through the manufacturing and shaping of our tiles, and on to the overseas shipping, storage, and distribution of our product. We pack our cream limestone tiles onto specialized crates or pallets that are firmly secured. We use local freight and courier companies to deliver our product to our commercial clients. Retail merchants and regional dealers of natural stone materials purchase our limestone tiles in bulk, and we set up recurring order schedules for most of our customers. However, no customer is too small or too unimportant for us. We guarantee a minimum amount of breakage on our shipments, and our price quotes accurately reflect what the purchaser can expect to receive in terms of usable product. Wholesale purchasing of natural stone materials, particularly tiles, becomes extremely affordable for the average flooring product retailer. Attracting repeat business is key to earning a substantial profit on this type of building material. It becomes a worthwhile investment to purchase bulk quantities of cream limestone because the retail price offered to consumers and commercial installers is quite appealing. Because Stonexchange carries a large assortment of natural stone building materials, mixing and matching of orders to include other products such as window sills and thresholds becomes an easy procedure. This is of special importance to merchants and flooring product dealers that depend on construction contractors for the majority of their business. A residential or commercial interior design that includes the installation of cream limestone tiles will most likely have instructions for marble, travertine, or possibly granite as well. If the installer is contracted for the entire job of placing the stone materials, he or she will want to locate a dealer that offers all of these products. The Nalboor Tiles product pages offer only a glimpse of what Stonexchange can offer you in terms of quality natural stone at fantastically low prices. In addition to truly wholesale prices on floor tiles made from limestone or travertine, we can customize an order for you that includes the exact style, size, and shade of window sills, transition thresholds, paver stones, or granite countertop blocks required for your job. Our expert marketing and sales staff is waiting for you to contact them with questions about pricing, order sizes, delivery schedules, and recurring shipments. We are your Miami and South Florida distributor of top-quality floor tiles and other natural stone products, and we guarantee personalized service when you do business with us. When it comes to natural stone tiles, Stonexchange and Nalboor Tiles are the only names you need to remember. Mocha color limestone from Spain. Vein Cut Crema Europa. Very Light Ivory to White Limestone Tile with some very small sesame seed size texture. This is a very consistent light color natural limestone tile. As in all limestones, this is a very porous natural stone and it must be sealer before and after installation properly by a professional. In the very beginning it will leave some foot marks, however as your floor age, it will find it neutral, subtle and creamy soft white finish. Its satin honed finish is matte and ideal for contemporary interiors. This is a top choice designers stone selection product usually used in high-rise condo apartments.